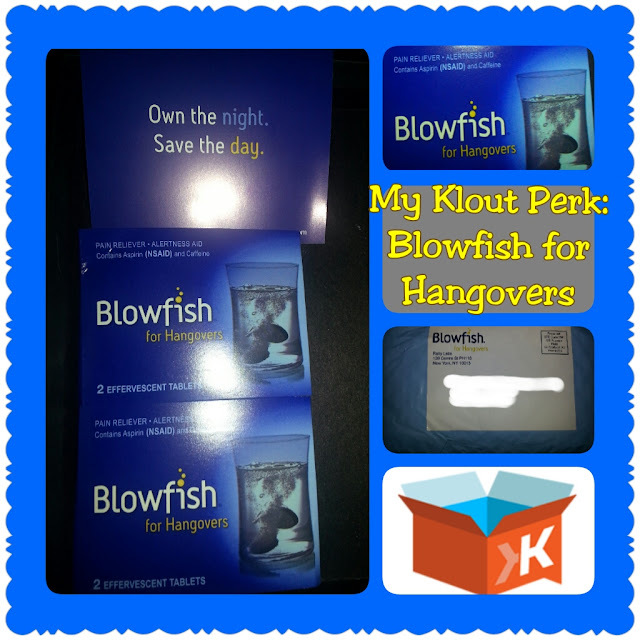 I just got in the mail my newest Klout perk. Its a set of makeup brushes from Real Techniques. 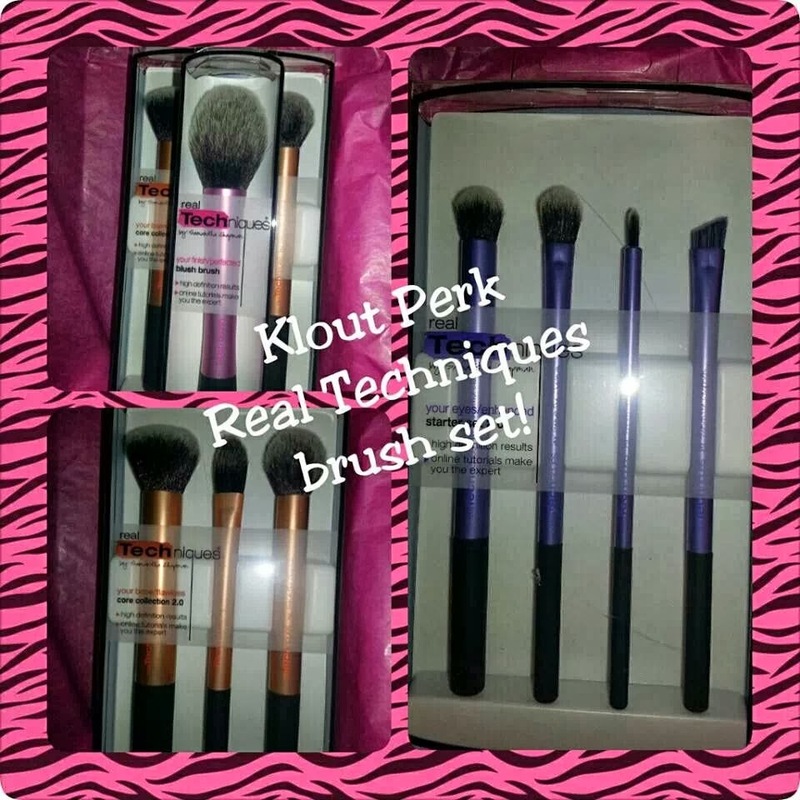 The kit contained a large blush brush, three facial brushes and four eye brushes. For those who don't know I'm a makeup addict. I love the stuff... I will be trying the brushes this weekend on myself and will let you know what I think. So far they are very soft and the handles are rubberized and strong. Ok who doesn't love free stuff? No matter a full size or a sample size. Its always great to get free things...Well since I'm out of work and have a lot of time on my hands. I signed up with quite a few companies to do surveys and test products. Some places want reviews for their products. I am willing to do that. I'm the kind of person if I love something the whole world should know. If I dislike it then the same goes. So this week I decided to try my hand at Twitter parties. Sounds like a great idea. I interact and answer questions for major companies and earn prizes. I was so excited. My goal was 2 parties. I liles them so much I did 5. I am out of work and have the time.I won't mention the companies I did them for. But they were of a varied subject matter. I did technology, skin care, family, and household products. However, I didn't win a prize. Maybe I went into it thinking I'm for sure to win a prize. Which was a bad idea! I'm there for the interaction, fun, helpful tips and meeting new Tweeps. Yes I call my twitter friends Tweeps.lol... I'm gonna continue to try these Twitter parties and hopefully do a little better in the prize category. If I find any ideas or tips I will share them with you. However, if your asking about how I was invited or became aware of these parties. Some I was invited via websites like Influencer or Vocal point (I am a fairly new member of both) Others where posted on the companies Twitter page or Facebook pages. And lastly you can always just use your old friend Google to find out where all us cool kids are hanging out. I did.Good luck everyone with Twitter parties. And if any one has any tips I'd love to hear and share them. They must know I've been know to have a few bad hangovers. Well I haven't tried these yet but I will after my next night out. I will post a review of them then. Klout also issues "perks" to people depending on their score. I think over 55 and your in perkable territory. Is perkable a word? I'm not sure but it works for me. Anyway, this is where you wanna be gaining perks. So far I've gained 2 bottles of Veev Vita Frute, cocktails. Samples of Blowfish for hangovers. Hmmm maybe they were afraid id over do it on the free cocktails? Also I'm waiting on a makeup brush set from Real Techniques to host a mini girls night in and try. So when I say try klout I mean it. And no I don't work for them. I'm just excited about the free stuff and wanna share the wealth. Ok so we all want free stuff! I mean if you don't, that's cool...More free for me. Yay! *happy dance* I am currently out of work and can't do much as far as sitting at a computer. So in my spare time, I've been searching for things to do via my smartphone. I have a Samsung s3 at the moment. Anywho I've found a ton of sites that I've signed up for samples and to be a product tester...As soon as I get a few in the mail I will post a new blog with links to sites that have worked for me...So far the best thing I've done, is get an account with Klout. There you link all your social media accounts to and can earn perks. Just this week I've earned 2 bottles of cocktail from Veev called Vita Frute. Hopefully my other ventures will be just as fruitful.